Are You Missing this Vital Ingredient In Your Content Strategy? Focused content… infinitely better than blurry content. Image via Shutterstock. Running a business blog is hard. Deadlines loom. Good writers are hard to find. And even the good ones will miss deadlines or disappear when you need them most. The result is often content for content’s sake. You end up publishing a post that isn’t the quality you’d like. Or a post that’s only “sort of” related to your brand’s message, products and offers. One of the least talked about but most critical elements of a strong content marketing plan is focus. Those posts that are almost on-topic or loosely related to your brand message can actually dilute your brand and confuse people about what you do, not to mention negatively impact your SEO. Like it or not, you must focus your content, and that takes commitment and discipline from everyone involved. To put it bluntly, great writing isn’t the hallmark of successful content marketing. It’s time we get back to the basics. A strong blog focus will make the entire content creation process easier — and get you the results you’ve been looking for. I get it. Talking about focus is easy. Finding your focus is hard. That’s why you see high-traffic, industry-recognized blogs that still lack focus. When they started out, they didn’t know what their focus was. They were doing what we’ve all done, trying out different topics until they found what worked. At some point, they have to focus. As do you. Because not focusing your content does more harm than good. What do you sell? What’s your site about? If your content doesn’t have a tight focus, you’ll hear these questions a lot. That’s because there’s a disconnect between your content and your offers. Content marketing is much more than branded publishing. It’s attraction marketing. If it’s doing its job, it should call out your best prospects and weed out everyone else. It should reflect your values, your voice and your brand promise. Teabox may be taking a loose-focus approach that, over time, could muddy their brand. Below, I’ve taken screenshots of three recent posts. The first two posts are good. But look at the third one. This is a good example of what I’m talking about. 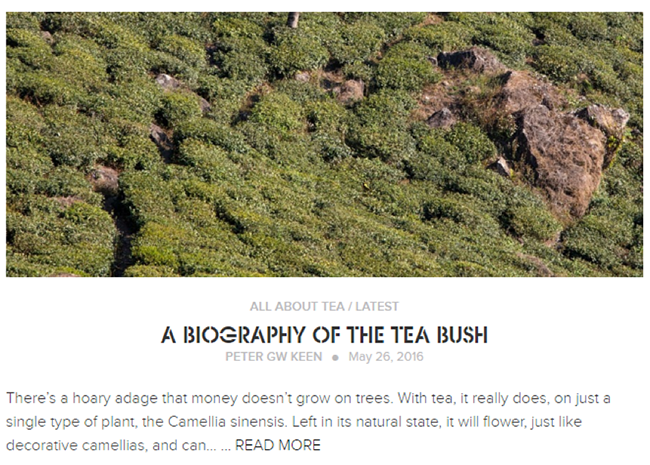 By creating a While It Steeps category, Teabox opened the door to blog about other topics, from music to literature. Right now, that may work. It’s definitely a creative approach to content — adding variety and human interest to the blog. 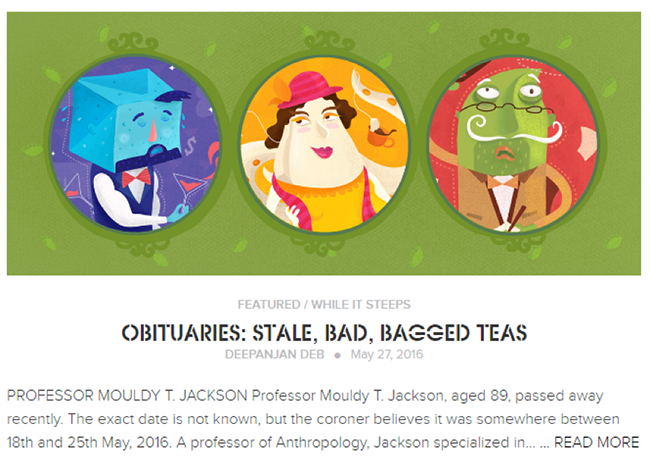 But if I only look at the blog, I have to wonder what Teabox is about. Do they sell tea, or are they a media company? Off-topic posts may be entertaining, but they can seriously undermine your SEO strategy. Your audience may see the connection, but search engines won’t. 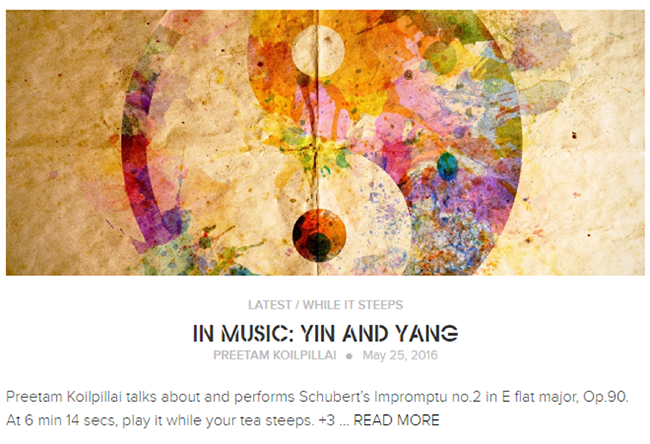 Teabox’s music and literature posts are a good example. From a content perspective, these posts are engaging and creative for existing visitors. But they’re not likely to attract new tea drinkers. Are these really the keywords a tea vendor should rank for? By pursuing these keywords, Teabox is telling search engines that it’s as much a music blog as a tea blog. These posts won’t likely win a page-one rank in SERPs for the music files, and they won’t attract tea drinkers at all. A blog is your best source for organic traffic, but you need to attract qualified traffic. The only way to do that is to keep your posts on topic. Here’s where the rubber meets the road. To leverage your content for sales, you need to be able to make offers that are relevant to your posts. Think about Teabox’s music posts. They’re likely to attract visitors who love the arts but have no interest in tea. These people aren’t prospects and won’t respond to tea-related offers. Not only is it okay to exclude them, it’s for the best. Besides, from a conversion standpoint, traffic from non-tea-drinkers will dilute the effectiveness of any promotion Teabox wants to make. Bring in fewer unqualified visitors. There’s a degree to which content is advertising for your brand. You promote it in social media and optimize it for search — why? To attract traffic. But not any traffic. The point is to attract qualified traffic that will fall in love with your brand and respond to your offers. To do that, your content needs to be meaningful for your business and your audience. It can entertain, persuade, educate or convert, but it needs to do that for your best prospects — not the web as a whole. This graphic shows you the possibilities when it comes to creating content. Notice that you can use a wide variety of formats. But don’t take that as license to create content on a wide variety of topics. Again: Your content should create interest in your brand and curiosity about your offers, which means it needs to be highly focused on the topics related to your products. 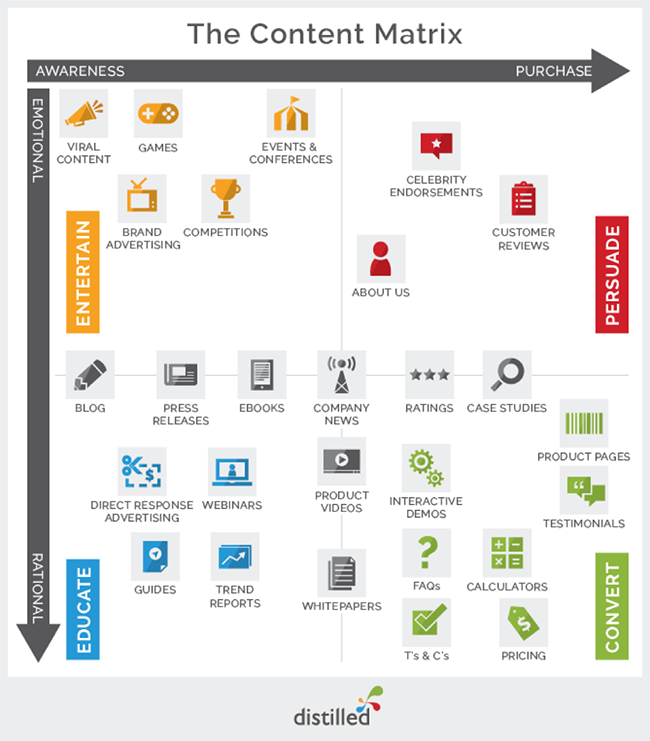 So how do you find your content focus? Sometimes your focus is baked into your brand. Teabox’s focus is tea. But sometimes it isn’t so obvious. If that’s the case for you, these three steps can give you a head start. If your content focus isn’t obvious, you need to reverse engineer it, starting with your top products/services or your core message. If you had to pick one “umbrella topic” that covers everything you do, what would it be? Next, jot down the supporting ideas and/or topics that you generally talk about when presenting your core message. These should be the topics or ideas that help you stand out from the competition. What do you do that’s unique to your brand? Based on your products, the discussions you have with customers and the answers to the questions above, list two to five topics that are central to your brand. For instance, Neil Patel’s QuickSprout talks about traffic and conversion. SEO used to be its core topic, but since search algorithms have changed, it now revolves mostly around content. The blog doesn’t use categories, but if it did, they would probably be content, traffic, and conversion. In most cases, you only want two to five supporting ideas. Your umbrella topic (core message) should be the main topic of all your content. That’s “what you talk about” as a brand. Your supporting ideas should be the categories of your blog. Any topic or idea that falls outside this list should be considered off limits — your content should attract your best prospects… and no one else. Once you know the topics you’re going to focus on, you’re ready to pick the keywords you should rank for. My favorite tool for this is Ahrefs — using one tool, you can do keyword, content and competitor research, making it easy to pick your target keywords. Keep in mind, if you’re in a competitive industry, you may not be able to rank on Page 1 of Google for the generic topic you cover, but you can rank for long-tail keywords or for related keywords. Ahrefs gives you the keyword difficulty (KD) for each keyword, so you know how accessible it is. For example, “content,” “marketing,” and “content marketing” may be so competitive that you’d have a hard time ranking for them, but “define content,” KD of 36, might be accessible. To clarify, keyword difficulty is a score that ranges from zero to 100, with 100 being the most difficult. The KD that’s right for you depends on your domain authority and number of backlinks, or referring domains, you’ve acquired. 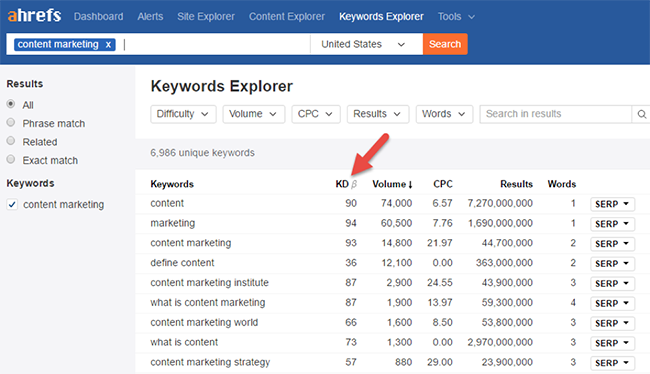 According to Ahrefs, to rank well for a KD of 10, you should have backlinks from 10 different websites, and to rank for a 90 KD keyword (such as “content” from the screenshot above), you’d need backlinks from 756 different websites. Bottom line, with a tighter content focus, you can pick a cluster of keywords you’d like to rank for and begin creating content that could help your brand show up in the SERPs. It won’t happen overnight, but by focusing your content, you have a much better chance of succeeding. If you aren’t getting the results you need, the issue may not be style or format or even writing quality. It may simply be that you aren’t focused enough in the topics you cover. Onsite and off, you need a tight focus for your content. It’s tempting to create off-topic content simply to meet your next deadline or entertain your visitors. Don’t do it! Find your focus and stick with it. 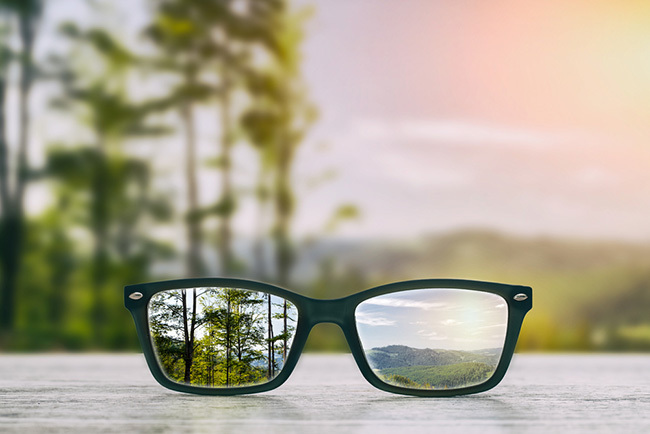 A clear focus allows you to create higher quality content with less effort — and finally get the results you’re looking for. What about you? Have you successfully found your blog focus? What’s your biggest challenge with narrowing the focus of your content?